Last week there was a lot of noise surrounding this so-called “new meteor shower” called the Camelopardalids (said — Camelo-par-dal-ids) which were to occur on Saturday, May 24, 2014 (700 UT or 2 – 4 am ET). This new shower was broadcasting around the media as “A shower that could generate up to 100 or 1000 meteors per hour!” Unfortunately, it didn’t live up to the media’s (or the public’s) hopes of a beautiful show, but that didn’t make this new shower any less awesome. This new meteor shower appeared to come from the constellation Camelopardalis (a very small constellation near the north star) which is where it got it’s name. Meteor showers are usually produced by us (the Earth) travelling through the dust left behind by a comet orbiting our star. As we travel through this dust, fragments of the discarded comet hit our atmosphere and burn up. This is what causes the bright streaks of light across our sky. Comets are constantly travelling through our solar system leaving behind dust trails, but it’s only the really dense clumps that we see. This shower is a result of a comet called Comet 209P/Linear which was discovered in 2004. This comet is about 1-3 miles across, and rotates less than once a day. This comet orbits the Sun approximately once every 5 years, and every time it orbits it leaves some comet bits in it’s wake. You may ask, why haven’t we seen this shower before? Well, this is for a few reasons. First, scientists think that this is a fairly old comet — it’s been around for quite a long time. This means that the comet is less active and likely close to becoming a “dead comet” (much like an asteroid). Dead comets don’t leave behind as much dust. It was so dim that we didn’t even know that this comet existed until 2004! Secondly, as It’s a fairly faint comet it leaves behind small dust trails. In a normal year, we may skim the outside of these dust trails and not see many meteors. Due to this, it’s very hard to pick up that we are travelling through any trail. But, in the past few months, a number of papers had been released by different groups regarding potential meteors that had been produced from this comet. These groups went back through their video meteor data and found evidence of meteors from this comet during April, May, and June, which suggested that this meteor shower has been around for a long time. What we saw this week was due to us passing through a number of dust lanes head on! This is similar to what occurs when there is a particularly good regular meteor shower (such as the Perseids). But, as this is a smaller, more inactive comet, what we saw was much more like a normal, light meteor shower. The debris that created the lovely show was likely from orbits over the last century! So, why the big let down? This because we don’t know a lot about this comet — some thought that there’d be a lot, and some thought that it would be the next big thing since sliced bread. Scientists are actually going to try to determine how active the comet was in the past by looking at the frequency of asteroids we see. From this, scientists found out that the comet was much more active in the past than they had thought. So, it wasn’t as spectacular as some had made it out to be, but according to some reports it produced some unusually slow meteors and at least one nice large fireball! Some estimates had suggested that there had been about 20 to 50 meteors per hour, with more brighter meteors than had originally been predicted. Answer via twitter @YorkUniverse, Facebook, info@yorkuniverse.com, or via the “Contact Us” form on the website! It’s women in space week as we celebrate the accomplishments of Tereshkova, Ride, Bondar,and the 4 new NASA astronaut recruits. Today’s show had a large coverage of content starting with Michael (program director at AFM) explaining, among many other things, the part he played in the Cosmo Quest on-air fundraiser. The Andromeda galaxy is home to a whole new set of stellar mass black holes, a new type of variable star was discovered, and a very …very… small dwarf galaxy was found. Is it a cluster? a galaxy? Check out the podcast below to see what our resident Australian Paul Delaney thinks. Thanks for listening all, show notes and podcast below. A big week for Canadian Astronaut Chris Hadfield as he announces his retirement from the corps. Harrison and Jesse fondly recall the highlights of his extensive and impressive career with the CSA. 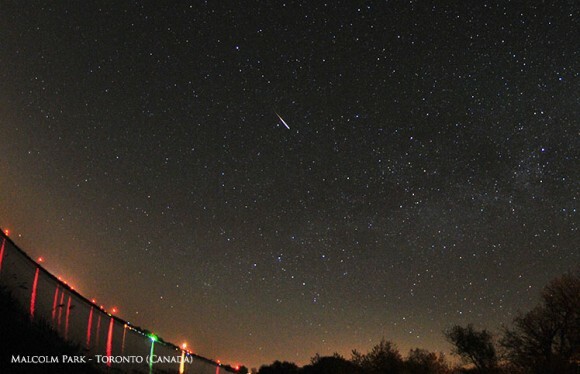 Are you an avid meteor shower observer? Hopefully you had a chance to check out the gamma Delphinids, a meteor shower last seen in June of 1930! Paul joined the show halfway through, mostly to make sure Harrison and Jesse weren’t pronouncing Aussie words incorrectly. This week in history the Hayabusa spacecraft returned from an encounter with Itakawa. It landed in Woomera, Australia. Thanks for listening all; show notes and podcast below.